All around the fundamentals of life are crying out to be shaped or created. In the winter of 2010, Jeph Jerman released Arrastre, nine multiples of rich, resonant drone work, in three formats. The Arrastre project itself, the bare-bone visuals stamped on the LP, CD-R and cassette packages, and the little I know of Jerman’s work since 1999, made me think of a few aspects of Joseph Beuys’ approach to art and life. One aspect is Beuys’ concept of social sculpture, essentially the idea that if you are an artist, you are an artist everywhere. Jerman has said the idea for making nine pieces of music, ranging from five to 20 minutes in duration, sourced from pot lids, came to him while doing the dishes. Jerman scoured thrift stores for serviceable lids, approaching them like Tibetan prayer bowls [caressing them with dowels], layered and edited the resulting whorls and eddies of overtones, and stamped them with what appears to be an enso, the zen circle signifying elegance and enlightenment. Beuys’ multiples, the artist has said, made him feel linked to whomever came to see or to own them; whether made from felt, fat or fish-bones, Beuys’ infused every day objects with energy, ideas and resonances. Jerman launched the Animist Orchestra project in 1999, gathering musicians together to create improvised music from pine cones, bones, shells and feathers. Several years back he released a distressing recording of a rabbit he found dying near his home. 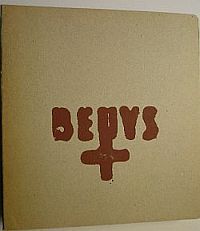 Beuys’ three days in a room with a coyote during his 1974 visit to America was similarly distressing, on a few levels. There is, whatever their divergences and differences, an overlapping animus, a drive to erase at least some of the precious, affected boundaries separating us from art. It’s a big project, Beuys quipped about these sorts of intentions. Many will find, laid out in writing this way, the concepts and the materials at work in Jerman’s now 25 year inquiry into sound and the act of listening to be slight and suspect, if not ludicrous. There was no less ridicule when Beuys’ picked up the cries of his surroundings, and began shaping his life to be a creative action, revealing many of the dualities stinking up the art world to be silly pretensions. Jerman has pointed his microphones at the desert, the animals, and the ostensibly inanimate detritus surrounding him in his adopted home in the Southwest U.S. for many years; given this seemingly inexhaustible alertness to the world as a sound-source, an epiphany in the kitchen was inevitable. If you are anything like me, and simply [as is possible] judge music by its sounds, Arrastre is engaging, radiant music, meriting its presentation as numbered multiples. There is, to be honest about my expectations entering a concentrated period of listening to a hundred minutes of pot-lid generated music, an improbable array of sounds heard across these three releases, with much ear-trickery as to what instruments precisely you might be hearing. I will take Jerman at his word that all that is heard is pot-lids. If people ask me what I do, Jerman has said, I usually say that I am offering a chance to listen. A simple engagement with the listener is sought, bringing to mind something Beuys said in an interview-...just as you have come to me, because of what I’ve made, and we can talk about it. There are no doubt [I have heard this sentiment expressed first hand by musicians I know] many, even among the readers of crow, who will aver that someone rubbing, stroking or striking bones, feathers or pot-lids cannot be regarded as making music on the order of someone who has studied theory, harmony and history, whether they be an academic or an autodidact. Those holding this perspective will certainly balk at another Jerman release from the winter of 2010 I like a great deal, Four Drivers, which consists of a piano harp’s strings being excited by four battery-powered fans for a considerable length of time. Four Drivers, like Arrastre, is a further exploration of drone music, but relatively harsher at times, an edgy and unsettling sonance to Arrastre’s serene overtones. The fan-generated spires of overtones and oscillations realize one of Jerman’s basic values in music-making, the reduction of the musician’s direct control over the direction a given process takes. Hardly a new value, but as I said, the resulting sounds matter the most, and Four Drivers has a cumulative complexity and power. Beuys’ living social sculpture was, whatever you think of the outcomes, a rigorous, vital way to contextualize his art- as Adorno wrote of Schoenberg, he sins against the division of life into work and leisure. I may have failed in my effort to convey how I see Jerman, whose Arizona desert milieu is a far cry from that of Berlin in the sixties, living a similar social sculpture of his own, making instruments from skulls and second-hand kitchenware, content to create multiples of what he hears crying out to be shaped or created. The idea called music is not separate from sound in general, Jerman says, yet we have made it so by devising roles by which music may be known. Like Beuys, Jerman’s role, since reinventing himself as a musician called Hands To in 1986 [the year Beuys died] is in creating work that is antithetical to what the Berlin activist called restricted entry-that is, the restricted entry of who has access to creative work [remember Jerman’s Animist Orchestra], what materials and means are legitimated by music pedagogy [pot lids! felt! ], and the ostensibly extra-musical role of pointing listeners to dimensions beyond those of their quotidian materials and means. Jeph Jerman’s Arrastre multiples sing because he is alert and attuned to the fundamentals all around us. This entry was posted in music writing on June 10, 2011 by jessewgoin.